Cormac McCarthy is never what you would call a pleasant or enjoyable read. If you decide to read a McCarthy novel you know you are about to take a walk on the dark side of life. 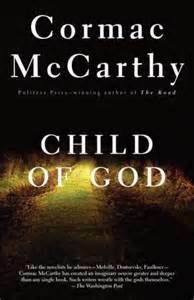 Child of God, McCarthy’s third novel, is a dark tale: shocking, disturbing, revolting. It is also lyrical, poetic, humorous (okay, sick humor, but still . . .). When you read McCarthy you are going to encounter some of the most beautiful writing you’ve ever read, telling you one of the most horrific stories you have ever heard. They came like a caravan of carnival folk up through the swales of broomstraw and across the hill in the morning sun, the truck rocking and pitching in the ruts and the musicians on chairs in the truckbed teetering and tuning their instruments, the fat man with guitar grinning and gesturing to others in a car behind and bending to give a note to the fiddler who turned a fiddlepeg and listened with a wrinkled face. This celebratory atmosphere is brought to a halt when Ballard threatens to shoot the auctioneer. He is prevented from doing so when an auction attendee hits him in the head with an axe. After that, Ballard “never could hold his head right.” Severely injured, he was taken away by The County. Homeless, he goes on to locate an abandoned shack, infested with all forms of insects and rodents. And this is the best residence he has – from here he drops to more primitive environs. Already an outcast in the community and a man of questionable intelligence – although highly developed wiliness and cunning – he begins a descent into a life of abomination. I’ll hunt some more later on. I think I was drunk when I hid it. Where’d ye hide it at? I don’t know. I thought I could go straight to it but I must not of put it where I thought it was. This book deals with some of the worst acts man is capable of committing. I will tell you that there is not a single redemptive bone in Lester Ballard’s body; he is a completely atavistic human being. But somehow McCarthy – as is his genius – forces us to feel a reluctant sympathy toward this horror of a man. I’m not sure that I could recommend it too widely but, I have to say, I couldn’t put it down.